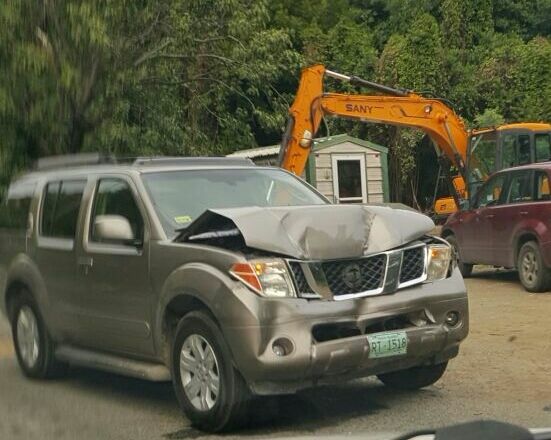 According to reports, after the SUV with the female driver was hit by another SUV it lost control and hit a dumpster before slamming into the trailer of the truck. 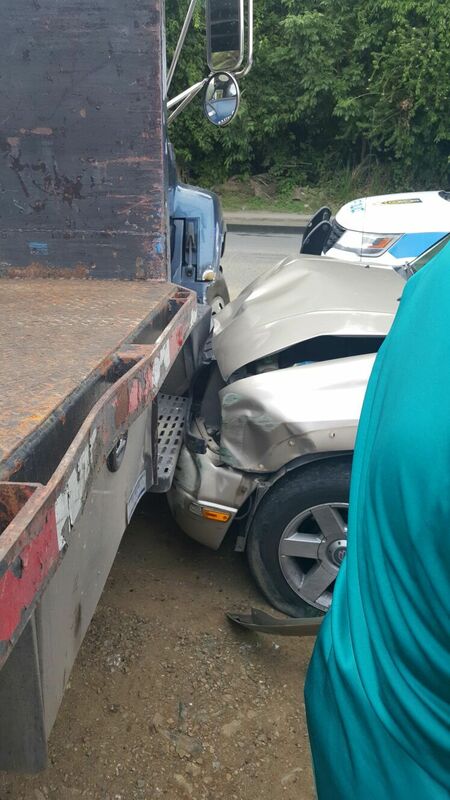 From all appearances, the woman has sustained injuries. 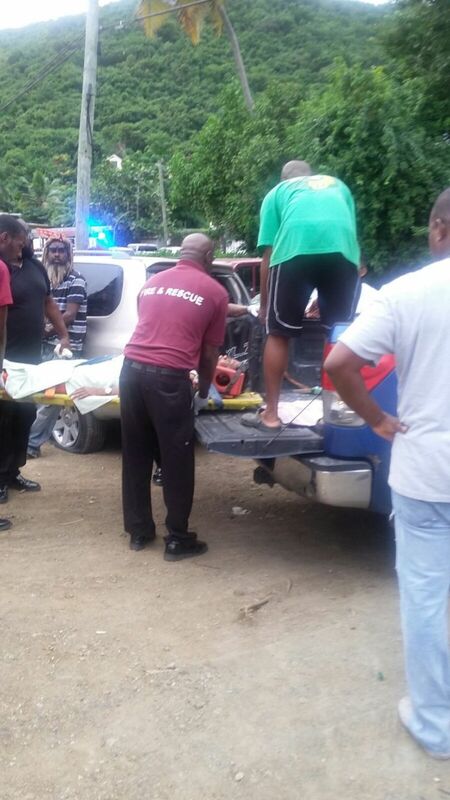 It is reported that a call for an ambulance was promptly made, however, it was reportedly on another run and after some 40 minutes of wait the woman was lifted into the back of a pickup and taken to Peebles Hospital for medical attention. Ambulance busy all holiday. Hospital 5 minutes away. Put the lady in a vehicle and get on with it. 45 mins is nonsense. For your information, this has happened before...... long before "all the way from trini came" The problem with the B.V.I when ever there is a problem no solution is sought instead it is always somebody's fault and most of the time that person is "not from here" It is time we wake up and realize that what happens to this Territory will affect us all from here or not. Your ignorance is shining!! What a stupid comment to make!! How can you blame someone who has just taken up the post for all the problems that existed prior to their arrival. One must think before making foolish comments. The "one" in this instance being you! get your facts right,the ambulance was on another emergency call.get your facts right before you start spreading rumors. @VINO..you need to get your facts straight, are you saying that there is just one ambulance ???? ?......my God such a Gheto society in the B.V.I. Wow amazing three places in the bvi i try my best to avoid peebles hospital. Bvi cabletv and flow . Da ain the same thing the article say??? Look how long the lady who was knocked down by the pedestrian crossing on Friday was lying on the street in the blazing sun before police officers and the ambulance showed up. I hope she is doing well. We need to do better. Signs of the time more to come. Happy New Year to all reading. I hope for this New Year that our government can get their act together. I know this might not be a fair statement but have anyone beside myself notice that we are loosing so many of our fine people in the BVI because of NHI. At first as citizens we could go to doctors of our choice overseas. Now we have to go to doctors that NHI suggest and those doctors are not the very best. It is sad to say but NHI (can someone come up with a meaning for it if they have not already done so) is causing a number of our citizens to move on to the other side. I know that we all have to walk that road, but these young ages that we see leaving us these days if they had their previous insurance to travel as they see fitting they might have been here with us to see 2017. Heard when they called a private ambulance the question was: Who will pay? What a shame and a disgrace after they made Millions and Millions off the back of the people they got the balls/ gull to ask such a question??? Seriously the private ambulance service made millions? and still running a refurbished old bus? I'm not saying this is the case but sometimes people call for an Ambulance in cases that don't require an Ambulance. 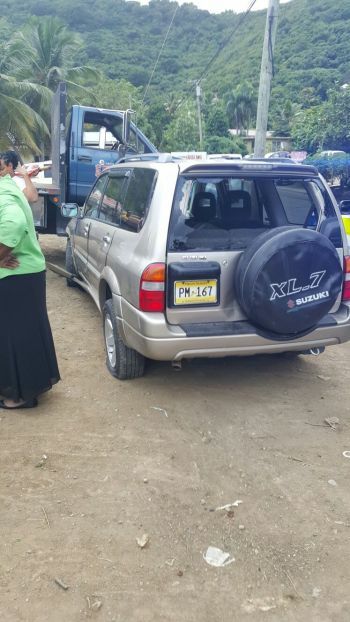 government is ready to spent 150 millions in a useless airport and if the ambulance is busy on one side of the island,you can die on the other side if you get in car accident.i saw this woman in the back of the pick up truck and still can't believe it. I pass there and went to west end to drop someone to the boat on my way back ms pickering was still lying on the ground such a shame the level of my country has dropped!!!! Our country is going to the dogs!! It is a total disgrace when our basic needs are not being met. Spending money on a new airport when the cost to travel will still be cheaper via the USVI, so the majority of travelers will still fly via St. Thomas. How many business travelers will we have coming in via Beef Island to justify the costs to expand the airport! Sewage still filling the streets of East End/Long Look!! When we get a breakout of cholera will NHI be able to cover the costs? Our roads are falling apart with patching here and there. We are catering to tourism and we want them to come to our islands to drive through the stench of raw sewage, on our bad roads filled with potholes, water supply at its minimum and electricity and internet never a guarantee? Come on government, don't put the cart before the horse, fix our beautiful Territory first in order to offer the best package to our visitors. Stop overspending and put the money where it should go first!!! Does the BVIHSA only have one ambulance in its inventory? Should the BVIHSA have at least two ambulances on duty during a regular shift? Should it not have at one ambulance as a backup to supplement ambulance services that are out services for maintenance or for repair? Does the ambulance have an EMT or a paramedic on board, along with the driver? Does the EMT or paramedic provide first line basic medical services during the trip to the hospital? Should emergency care be a top issue? I don't care what there excuses were, it unacceptable to have such horrible services. That's my mother and no this isn't Deshawn! It's the other son that's state side and I think, that's absolutely perposturous for my mother to be treated like road kill. For my mother to be carried to the hospital in the bed of a pickup truck. And for all we know, that riding in the back of the truck could have done more harm than good! My mother could have sustain more injuires All those tax paying dollars, for BS excuses and incompatacy! It's a dam shame. And I'm sure there will be no repercussions for this inexcusable behavior! I wouldn't wish anyone mom to be treated like this, not even my enemy.